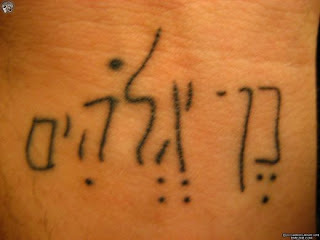 Bad Hebrew Tattoos: Yes God! Look at this superb piece of art. A truly spiritual scribble, "Son of God". Or it would have been, had the author known their Hebrew letters. As it goes, a tiny bit or the first letter was omitted, turning the BET into a KAF and consequently the word "Son" into "Yes". "Yes God", a true devotee. Very sad, but not the end of story. The word God is also messed up. The vowel formation under the ALEF (4 dots, like a gaming cube) does not exist in the Hebrew language. The author of this tattoo apparently invented a new Hebrew vowel, how is that for true divine inspiration? Hardly an invented vowel - just a mangled form of the original one, hataf-segol (אֱ). Still funny, sure, but not WTF-funny, just facepalm-funny. Actually, your word says "to remember", but yes it is correct. Lucky for this guy, this tattoo can be easily fixed with just a simple line adding and a stress (dagesh) inside the "Bet".